Jack and ich I spent the weekend in Mureck with Sabrina and her girls. We also went to the exhibition in Koroska. Jack and I stayed together in Mureck with Sabrina and her girls. Samy's Puppies are 4 weeks old and lively little puppies. We were allowed to visit Sabrina's dog school in Mureck which is very recommendable. 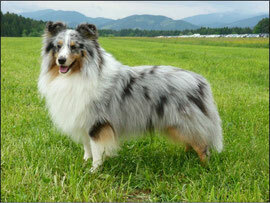 On Sunday we went to Slovenia and presented Jack and Kelly at the dog show in Koroska. Both presented very well in spite of the bad weather and the muddy ground. Jack got an ex1, CAC-SLO and the BOB. I'm so proud of him. Kelly got "only" an ex2 because of a bad decision of the judge, but she did a great job.